Empire Harvests is an apple processor, and we love what we do. As a family team working side by side for over 20 years. 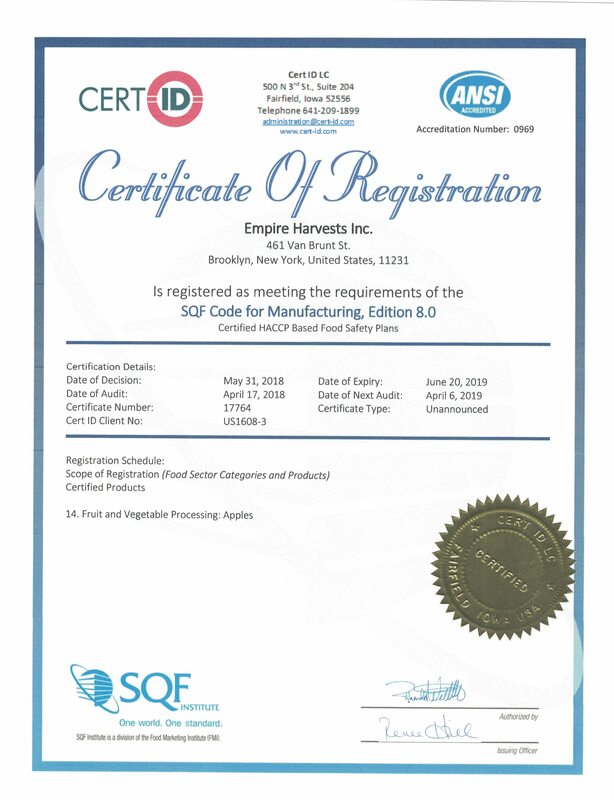 Our goal at Empire Harvests Is to provide fresh sliced, diced and whole cored apples to quality conscious bakers. As a family owned business established in 1990 we have been serving the baking industry with daily deliveries of fresh cut apples. We process and prepare our fruit fresh daily throughout the year with our modern state of the art equipment. Our products are delivered with our fleet of refrigerated trucks on a daily basis. Our company consistently follows strict procedures of GMP (good manufacturing practice) and HACCP (hazard analysis & critical control points) as well as allergen control programs. Apples are processed at our SQF Certified facility. We are dedicated to producing only the highest quality food products and maintaining strict safety guidelines in our processing facility. Food Safety is the most important aspect of modern food production. We take pride in our product, and thorough processes we follow to insure only the safest, highest quality products are delivered to our customers.